Hi everybody ^_^ I am back with my new wallie >_<! Enjoy it! All comment and fav are welcome as always ^_^! this is wonderful! another Goto P wall, you must really love this artist. I will skip the usual and leave the comments to others, this is again a great wall, so warm...I have the other version with her overlooking the sea, and this one is just as good. Love the hills, very nice scenery. Nonetheless, it is great! A fav! there is some jagged edges on the back of her hair, (right side top hair) you might wanna check that. Very heartwarming image and background. Love the flower bed. Nice work on the mountains. Nice work on the sun. Beautiful work! Ahhh I've been waiting for a new wallie from you phamthuha and as always you have impressed me and made a smile appear on my face. Every single day I visit MT with the hope to see a notification, that says that you created a wonderful wallie once again...and this notification didn't lie. I love it...the sky, the flower garden and how the stock has been blended in all of this. It is gorgeous, peaceful and even with my eyes closed I can still see this beautiful image in front of me. It is why I love this site, to see your wallpapers and tell you how much I love them. From the day we met, I have been commenting your wallies and added them in my favorites, because they are all beautiful. finally, a new wall from my lovely sister ^__^ I am so happy that you decided not to leave allof us here thuha-chan. Great scan, great colours and a fantastic background. Really good, one again. The colors are really warmed. Just a reproach: I think the mountains seem to be too much basics (I want to say that there is not enough dimension, but I know it's difficult). The field with flowers is really cute, and the sun in the morning sky is impressive. wow.. very beautiful colors and landscape scenery in it . i can see the difference from the original to the wallpaper u created~! looks like u took alot of time n effort~! *^-^* CUTE N WONDERFUL WORK OF ART~! 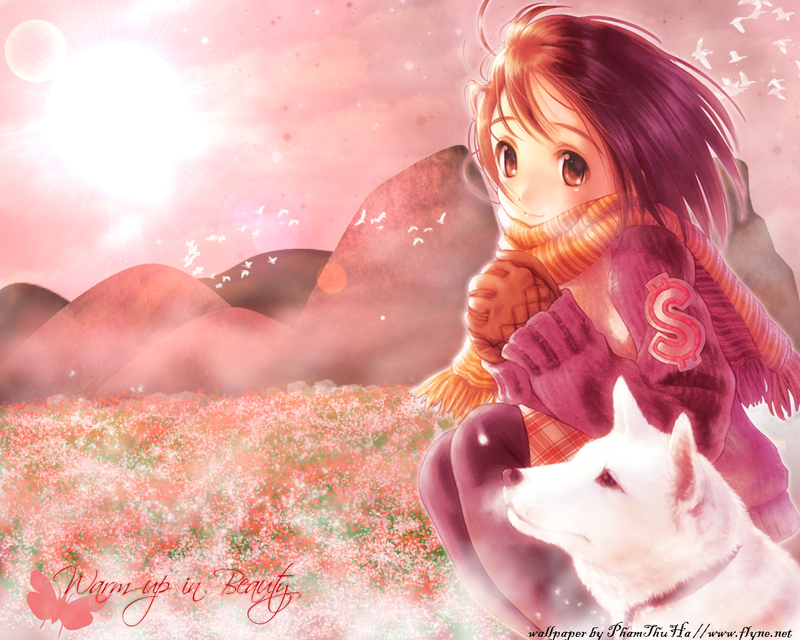 Beautiful ^^ You created a really beautiful and warm wallpaper. I like the colors and the title fits perfectly. eeek .. reeli nice one ! oh yay, from the scan, to your wall......so difference, so beautiful ><. Hum...the moutain looks a bit weird, not real ><. any others are so great ><. Outstanding work Phamthuha-Chan :) you really did a superb job! I don't know where to start, .... I'll start with the title "Warm up in beauty" this title is fitting so much with the wallie because it looks so warm especially the colors you've chosen they are really warm! not to mention that the sun is also adding that warm sensation to the wallie, I really like how you made it! the scan you used is suiting well with the background and smoothly blended! It is quite nice and the flower field is beautiful. The shape of the mountains maybe is a bit too simple or just to round I think. I know that a lot of people love all over purple or all over pink wallpapers but I think it would be better if there was a contrast like on the original scan. So you're back with a wonderful work, phamthuha. U r naughty girl, makes everyone worried that u want to quit :D. However thanks goodness that you're back. The text, I think u should try more another font, I have the feeling that u use this too much. That's all, impressive as always, phamthuha. +FAV. P/S: I really like this font, can u send it to me. Thanks a lot.